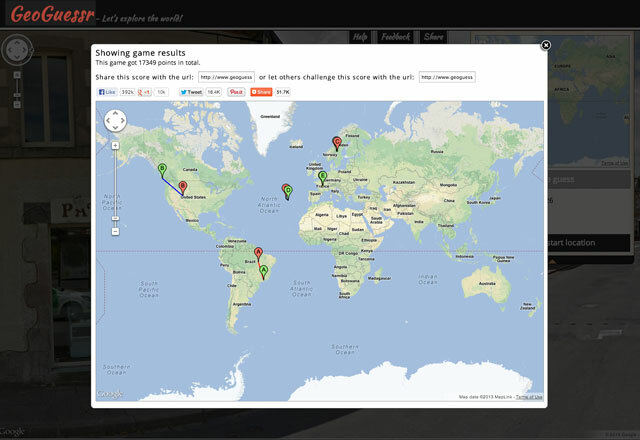 Spotted via Hacker News a site named geoguessr is an addictive guessing game that has you look at Google Street View imagery and you click on the Google Map to say where that image was taken from. For example, if you see a street view image of Time Square, if you click on New York City, you will guess right. Well, there is never any wrong guesses. You are scrolled based on how far away you click from the actual location of that street view image. The closer you click to that location, the more points you score. You can see other people's scores at Hacker News and as Matt Cutts commented there, "Warning: it's pretty addictive." Indeed.